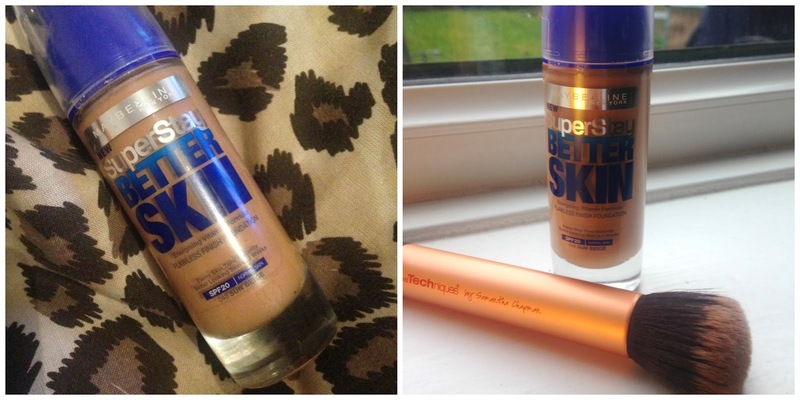 Im always trying different foundations so when I was searching through superdrug the other day this bottle caught my eye! After testing the sample, I always so this and I always end up putting too much on my hand, (whoops!) I decided to buy it to try out! Ive never tried a Maybelline foundation before but id always hear good reviews so I thought id give it a shot and I love it! I always tend to use liquid foundations because Ive got a normal skin type and this foundation I found was oil based so if you have oily skin I would stay away! I applied the foundation with my Real Techniques buffing brush (one of my favourite brushes) and it went on like a dream! The colour matched me perfectly (I went for 048 sun beige) and didn't feel like I had any foundation on! it acted like a second layer of skin and didn't feel cakey at all! Overall I really like this product and I would definitely repurchase it again as soon as I runs out. My advice would be to try this product out, it didn't disappoint me in the slightest and its in the top 5 foundations ive used so far! I'm super pleased with the foundation as a whole! To order online you can buy it from Superdrug. NOTE:I'll be posting a lot more frequently from now on and with more of health and fitness posts and posts on keeping fit on the build up to summer!